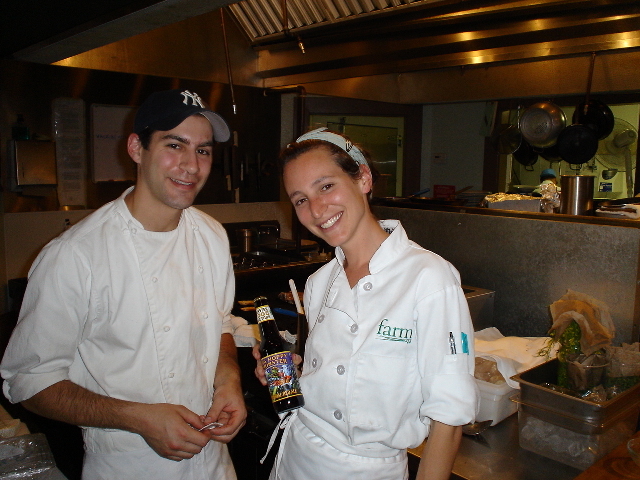 The chefs at Athens' Farm 255 love their beer. There is no better choice with fine food than fine beer. Long ago in the sordid history of Europe, the French managed to convince everyone that everything French is more refined and appealing. This idea still echoes today in our opinions regarding wine and beer. For example, many think that wine is always the superior accompaniment to a fine meal. I protest. Beer can be just as complex and flavorful and wine, there are more styles of beer in the world than wine, and many people today (especially the Belgians) will argue that beer is the beverage of choice alongside a superb repast. Just try to find a fine wine to go with Mexican food – it’s no easy task. But a smooth, earthy, slightly dry Vienna Lager beer with subtle notes of toast and caramel fills the bill quite nicely. Stuck for a great wine with Buffalo wings? Grab a dry, refreshing American Pale Ale instead and you’ll admire how the citrusy hops of the beer compliment and also tame the spiciness of the wings. Hard pressed to discover a great red wine that goes really well with cheese? Low acidity, creamy carbonation and sweet barley malt makes many beers exceptional companions to a wide range of cheeses. Beer’s mouth-watering malt flavors blend with the savory notes of many foods, and the carbonation in a beer makes a wonderful palate cleanser that lifts flavors off the tongue. Beer is often more subtle and not as acidic as wine, and this fact allows beer to complement more the delicate notes and flavors found in a variety of dishes. One of the most appealing traits of a fine beer is its ability to be refreshing and complex at the same time. The delicate flavors of lighter fish or chicken dishes blend beautifully in the mouth with a golden, subtle beer like Pilsner Urquell or a tangy, slightly sweet Belgian-style White beer such as Sweetwater Hummer (made with wheat, orange peel and coriander). More flavorful fish selections such as salmon or snapper go better with a more spicy, dry American Pale Ale like Sierra Nevada. The tart, spicy quality of many wheat beers go well with salads with acidic dressings. Try a Bavarian Hefeweizen like Paulaner with a spring salad of mixed herbs, walnuts, cheese and a light oil and vinegar dressing. Wheat beers (with their complex, bready, cereal tones) are also the perfect choice for mild brunch fare such as poached eggs with Hollandaise sauce and smoked salmon with capers. Slightly sweet, earthy dishes are a beautiful counterpart to beers with sweet, malty overtones. Sautéed mushrooms are a delight with a Nut Brown Ale like Newcastle; pizza is perfect with an Amber Ale such as Rogue American Amber; fried fish or chicken is scrumptious while sipping an English Ale like Fuller’s ESB; and oysters and scallops alongside a dry, black Stout or Porter are divine. Hops are aromatic flower cones that grow on vines. When boiled in beer, hops provide a bitter counterbalance to the sweet malt that is made from barley. Many people have compared the bitter flavor of hops to the tannin bite of a red wine. Any dish (like lamb or steak) that goes well with oaky, tannin-rich wines will also work well with a bold, bitter beer such as Terrapin’s Big Hoppy Monster or Avery Hog Heaven Barleywine. The strong, spicy flavors of Indian food will turn a white wine hot and completely overpower the subtlety of the wine. Instead, try a strong, flavorful Belgian blond ale such as the peppery Saison DuPont or Duvel with your next plate of chicken vindaloo. The beer will cool the palate but will also be a perfect marriage to the peppers, herbs and spices of curry. Let’s be sure not to omit the obvious beer and food pairings. A German Lager such as Spaten or Ayinger contains the perfect blend of sweet, golden malt and spicy hops to stand up next to a plate of wurst sausages and sauerkraut. An English-style Bitter like Old Savannah Pale Ale or Hobgoblin just makes your mouth water for a Shepherd’s Pie drenched in brown gravy. Nothing quiets a burning palate after a bite of nachos and jalapenos like a crisp Mexican lager like Cancun Pilsner from Atlanta’s Zuma Brewery. And it’s okay to admit that you really can’t beat a hot dog with mustard alongside an American Standard Lager like the award-winning Old Milwaukee. The Belgians started the now popular trend of cooking with beer. Cuisine a la biere has become an exciting new niche in gourmet circles around the world. Substitute beer anytime that water, stock or wine is used in a recipe and you will embark on a new taste sensation. English ales are a marvelous way to deglaze a pan while cooking red meat; fruity Belgian Golden Ales make great additions to buttery seafood sauces; and German Double Bocks (like Celebrator) mixed with soy sauce, garlic, ginger and herbs make a luxurious marinade for fish or chicken. Strong Stouts like Samuel Smith’s Imperial Stout or Terrapin Wake ‘n Bake are even good in homemade, mustard-based barbecue sauces. If you think that beer has no place as a dessert ingredient, then you’ve never sampled scrumptious ice cream made with Guinness Stout. What about beer alongside dessert? Dark beers like Porters and Stouts are made from barley malt that has been roasted to produce chocolate and coffee flavors. These beers go well with fruit custards or cheesecakes and are terrific with a bowl of vanilla ice cream or a handful of chocolate chip cookies. Never drink a fruit beer with a fruit dessert – there are just too many opportunities for clashes. Instead, sample a great fruit beer (made with real fruit) like Bar Harbor Blueberry Ale alongside a French pastry with whipped cream. Beer is a wonderful, welcoming beverage that has great appeal to a wide variety of people around the world. Beer suites so many different seasons and occasions that it only makes sense that it should hold a special place at the dinner table – or the brunch or lunch table for that matter. Beer has the enticing talent of producing delectable complements and contrasts with a wide variety of foods, and experimentation with different pairings is always an interesting and enjoyable experience.